Big Box Stores: Fully conditioned retail space with multiple large package units, evaporative coolers and associated duct work for national retail customers including Sears, Ross, Home Depot, Michaels, Marshall’s, Pet Smart and Orchard Supply Hardware. Strip Malls: Build-out for individual tenants or entire strip malls including design, engineering, installation of package and split system units, evaporative coolers, associated duct work and controls for retail customers including Disney, La-Z-Boy, and Williams Sonoma. 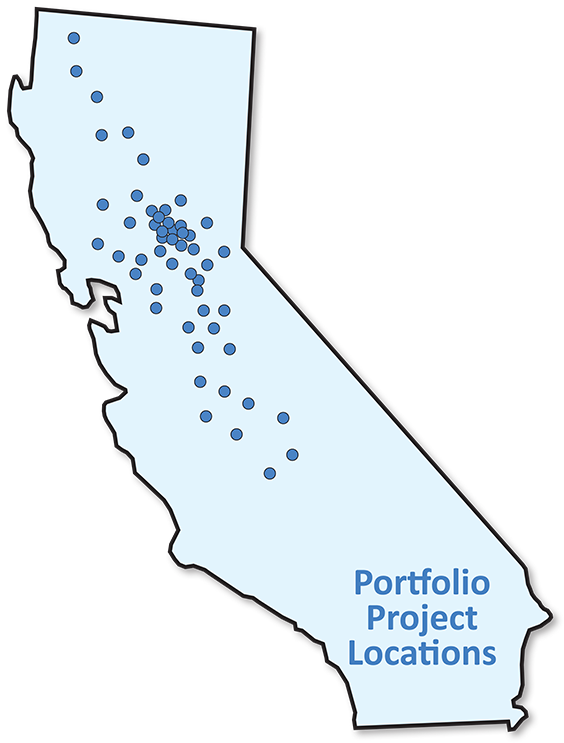 Water Source Systems: Construction of a new office spaces for PG&E, Granite Construction, UC Davis Center for Mind & Brain, State Welfare System, Accenture, Insweb, Walgreens, Five Star Bank, and Ryland Homes. Complete water source heat pump systems were installed with new core mechanical equipment. VAV Systems: Replacement, re-engineering and retro commissioning of antiquated built-up systems with more efficient VAV systems and package units for multi-zoned commercial spaces. VRF Systems: Installation of variable refrigerant flow (VRF) systems (by Mitsubishi, Daikin and LG), building controls and associated duct work in buildings up to 110,000 sq ft. Several buildings certified LEED Gold. Office/Warehouse: Design/build numerous single and multi-tenant occupied warehouse/office spaces for customers including FedEx, Raley’s, Pepsi, etc. Mega-Warehouse: Conditioning of large distribution centers (200,000+ sq ft) including completely air conditioned facilities, large CO2 exhaust systems, walk-in refrigeration boxes, and heat recovery systems. Detailed energy calculations and life-cycle costs presented to owners for system selection based on initial and life-cycle operating costs. Projects include ProLogis, Sears, JC Penney, Fastenal, Quaker Oats, etc. Commercial Kitchen Facility: Remodel of the existing office space for Le Cordon Bleu. A total of 29 commercial kitchen hoods and exhaust ventilation systems were installed, sealed and tested throughout the facility. Large Crash Fire Station: Department of Defense Spec Fire House for Travis Air Force Base Large Crash Fire Station. Design/build special purpose fire house including vehicle storage and living quarters. Designed for LEED Silver certification. Heat Recovery System: Rogers Coffee heat recovery system. Design of a heat recovery system that directs the excess heat in coffee bean roasting to absorption chillers to cool storage warehouse, thus cooling the 80,000 sqft warehouse for no additional energy costs. Solar Absorption Chiller System Retrofit: Construction, design, and feasibility study for the retrofit of a conventional A/C system with a new Solar Absorption Chiller System. The Solar Absorption Chiller System uses energy from unique solar collectors to run a thermal absorption chiller to produce chilled water. The design and feasibility study included detailed energy analysis and life-cycle cost projections which are critical in Green Building design. Dept of Water Resources/IRS/NOAA Data Center: Multi-faceted, multi-tenant project included complete design, engineering, structural steel, hydronics, and electronics for the replacement of a 20,000 lb. roof-mounted water cooling tower and installation of a high-capacity condensing fan unit. Upon completion of the newly installed cooling capacity, new Liebert computer room air conditioning (CRAC) units were installed down though a custom-cut roof hole, and lowered directly onto the data floor. The space was resealed and the units commissioned. Work performed with no interruption to continuing operations. Mule Creek High-Security State Prison: Design, structural engineering, regulatory compliance and controls integration of roof-top boxcar units. All work accomplished under the strict personnel and tools control parameters. Rancho Cordova Police Headquarters: New construction project with VAV system, full building DDC controls, dedicated server room and holding cells. LEED Silver certification. California Governor’s Office: COAC installed two new CRAC units along with integrated humidity controls, humidifiers, variable speed pumps, and fire suppression interlock dampers. The new computer room units were tied into the central chilled water system for the Capitol Building and the surrounding government buildings. The new system was integrated into the Capitol’s cooling and control system. Department of Fish and Game: COAC installed new CRAC equipment to meet their existing and future heat load requirements. We also coordinated the rack layout for proper hot-aisle, cold-aisle distribution. This allowed the IT department to raise the CRAC temperature set points while maintaining proper cooling for the IT equipment. This ultimately led to decreased strain on the air conditioning units as well as reduced operating costs. Woodland High School, Foothill High School, El Camino High School: Extensive remodel and retrofit of high school facilities including cafeterias, theatre spaces, classrooms and gymnasiums. Modesto Junior College: Installation of central plant system to serve campus-wide buildings including chillers, pumps, exhaust systems and complete controls. Dept. of Veterans Affairs Medical Center: Multi-year major seismic retrofit and remodel of a multi-story medical center including pharmacy, pathology labs, examination rooms and patient suites. Telecare Mental Health Rehabilitation Center: Construction of a purpose built HVAC system to support in-patient 15-bed sub acute secure, psychiatric special care facilities, medical and administrative offices. Project was performed under tight time line and regulatory compliance review. CalTrans Main Lab Remodel: Removal and replacement of 2 large chillers, 11 large air handlers, multiple exhaust systems and all hydronic systems and duct work. Installed new DDC control system and performed extensive commissioning.